Ten minutes seemed like an eternity.This is the amount of time it took Joey 'Jaws' Chestnut to consume eight pounds, 5 ounces of deep fried asparagus. Matt 'Megaload' Stonie took second with 7 pounds, 14 ounces.It was a beautiful day for a competition. 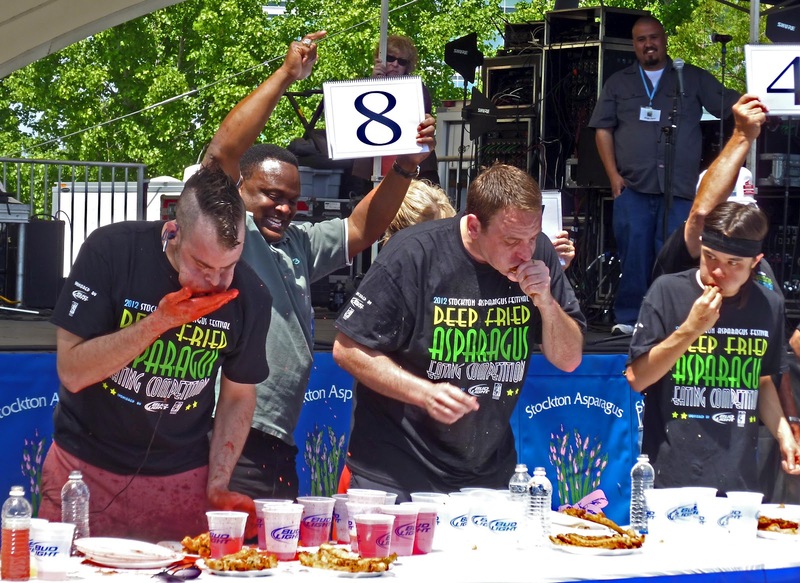 The 'Stoction Asparagus Festival' was the venue for this gallant battle of the Major League of Eating. I think I will have some asparagus with dinner. Boiled bacon? This will be a Mad Meat Genius first. The inspiration for this madness is Guy Fieri making an over the top burger on his show. 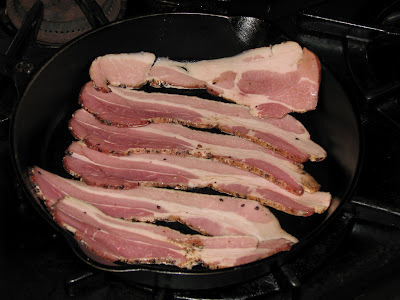 Bacon is boiled for two hours. 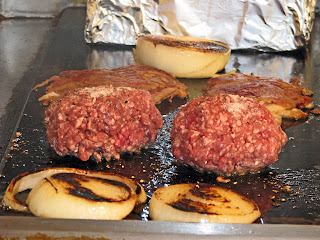 It is drained and formed into patties. 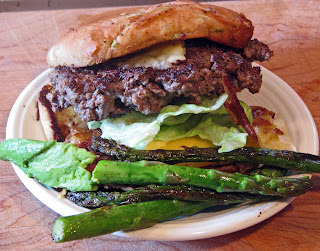 It is then fried and used as a garnishment for a hamburger. How could I resist? We will be using some generic bacon purchased at our local Wally-Mart. 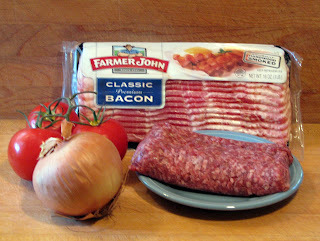 The hamburger will be made with ‘pink-slime free’ ground beef procured from our friend Angelo. We did have to make a special bacon press for this procedure. The first step is to boil your bacon. A whole pound of bacon will be put into a large pot of cold water. Bring to a low simmer and cook for two hours. The first thing we noticed is the smell. Boiling bacon emits a putrid smell. Is it the chemical preservatives in this no name bacon? We had to open a window. After 2 hours remove and drain your rashers. 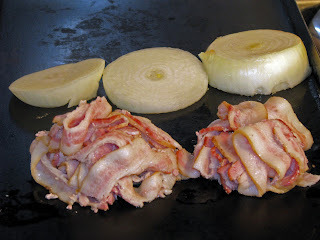 Let bacon cool and then form in to two patties. Yes, you read correctly, two patties. Place your formed patties on a hot griddle and place your bacon press on top. Our special bacon press was created with a brick from the back yard. It was brushed free of dirt and wrapped in aluminum foil. Place your shiny brick on top of your bacon patties. Cook for 3 or 4 minutes on each side until golden and crispy. Our special bacon press worked like a charm. I will spare you the details of cooking the actual hamburger. We did use 8 ounces of meat seasoned only with kosher salt and freshly ground pepper. Assemble your burger with all the usual accompaniments including your bacon patty. This was one large hamburger. The beef was juicy and tasty. The bacon patty was crispy but not very flavorful. In fact it was a little disappointing. The salt had been removed from the boiling process. We never re-seasoned this patty. I am not sure salt could have rescued this bacon puck. Not all cooking endeavors are a success. This is one. We love to take a road trip to the ‘U. C. Davis Animal Science’ meat sale. It is only held on Thursday’s and Friday’s for limited hours. Today we picked up a small three and one half pound brisket roast. This cute little bundle of beef was from the point end of the brisket. This end has more layered fat hence more flavor. 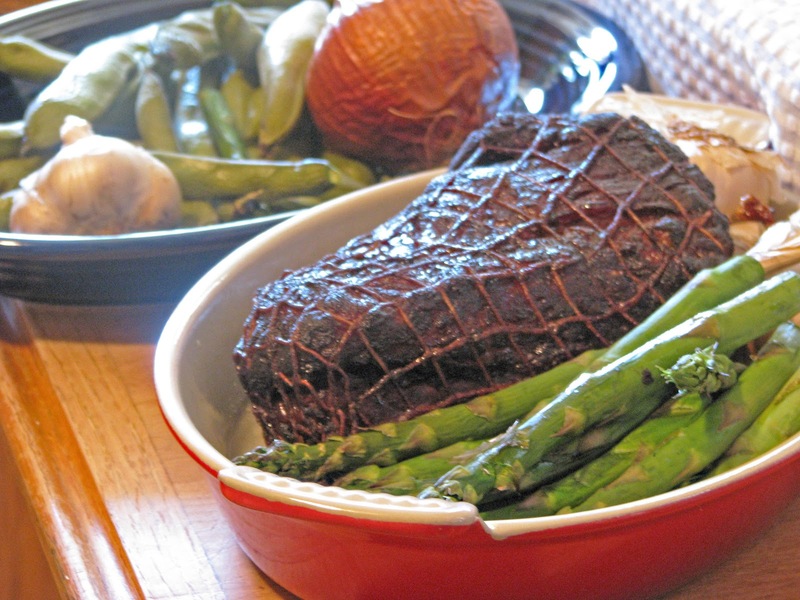 With proper cooking this raw, fatty meat can be transformed into meat heaven. This roast was going to take a sauna in our smoker. 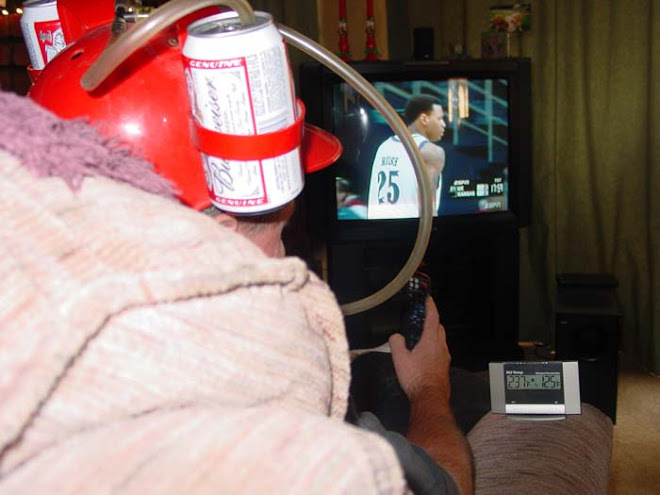 The preparation was simple. We sprinkled our roast with dry rub. It was left out of the refrigerator and brought to room temperature. 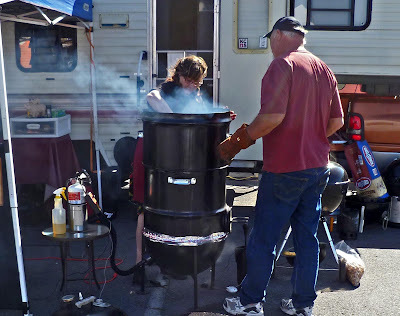 Our smoker was brought to 230 degrees. 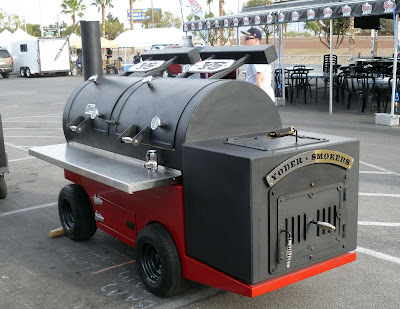 A combination of hickory and apple wood chunks would be the flavor of our smoke. It took a little under 5 hours to cook our roast. It was rested for 20 minutes before serving. There was room on the smoker for accompaniments. Asparagus, whole fava beans freshly picked from our garden, whole garlic bulbs and onions were scattered around our roast the last 45 minutes of cooking. These vegetables soaked up the smoke and softened to perfection. 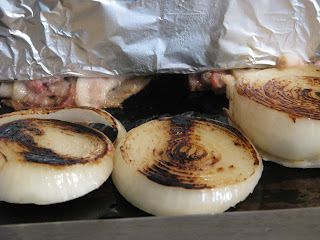 The roast was sliced and served with our vegetables. This was one smoky delight. The point end of the brisket has so much flavor. The smoky crust has a caramelized candy like texture. This is meat candy that we love. I do not always eat ice cream, but when I do, I prefer 'Extreme Moose Tracks'. Chocolate ice cream with chocolate shavings and chocoalate chips make for a chocolate treat. Now, that is what I am talking about. As some of you may know Ms. Goofy and I have started a new journey in life. We have both officially retired from our places of employment. Ms. Goofy worked 35 years and I 32 years in our respective jobs. Ms. Goofy is learning to sleep in and I have stopped shaving. 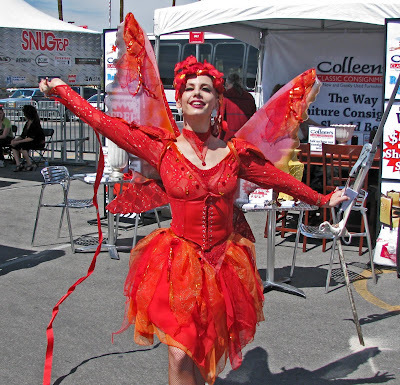 We now have a lot of time on our hands for our hobbies and hope to share them with you. Pizza was on the menu tonight. 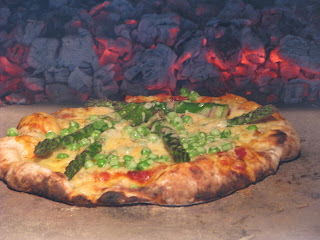 The fresh peas and asparagus was harvested from the Richmond's farmers market. The dough was proofed with Zoomie sour dough starter and fortified with whole wheat flour from 'Green String' farms. Five different cheeses from Ms. Goofy's cheese vault was the yummy glue for the peas and asparagus. Home made sauce completed this 'Spring' pie. A kiss of fire from our wood burning oven made this a wonderful meal. Peas pass the asparagus. My latest review on 'Peppers & More' can be viewed here. Happy Asparagus! 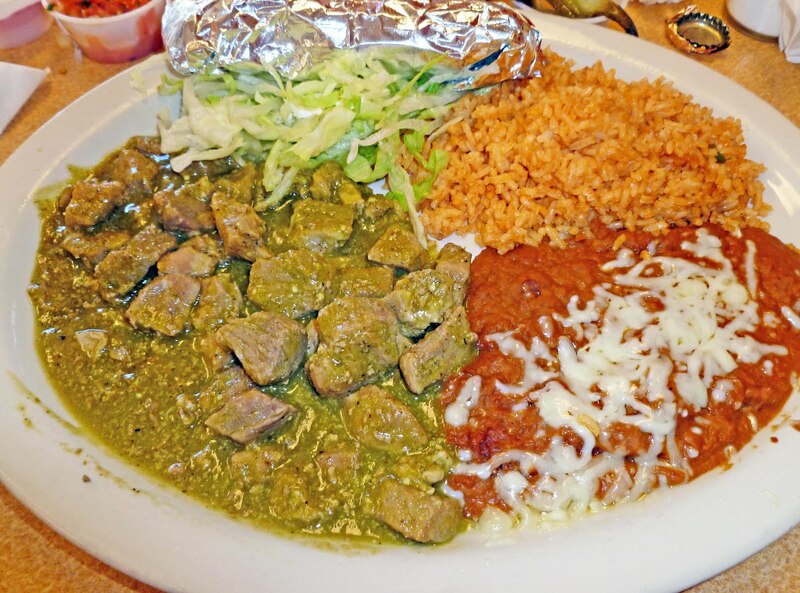 The quest for the ultimate plate of Chile Verde brings us to a small taqueria located in Concord, California called ‘Los Pinos’. 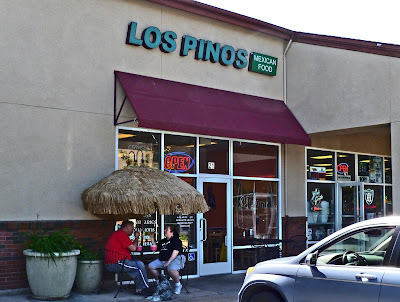 Walking through the doors of ‘Los Pinos’, a feeling of déjà vu occurred. 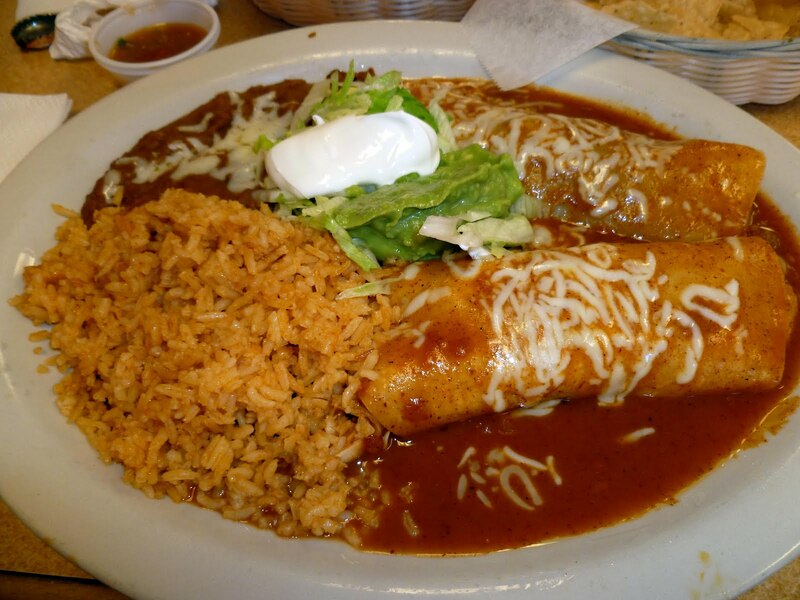 The brightly colored Mexican themed mural, the large menu board, the open griddle and the salsa bar could place us at almost any tacqueria in Northern California. Like preprogrammed robots we marched to the counter and went through the motions of the quest that we are committed to. A trip to the salsa bar is always a ritual that must be completed. This salsa bar was clean and tidy. Verde/tomatilla, pico de gallo, pickled jalapenos, sliced radish, crushed tomato salsa, and roasted peppers & tomato salsa were scooped into small plastic cups. These were all sampled at our table with complimentary tortilla chips. The roasted peppers & tomato salsa was our favorite. 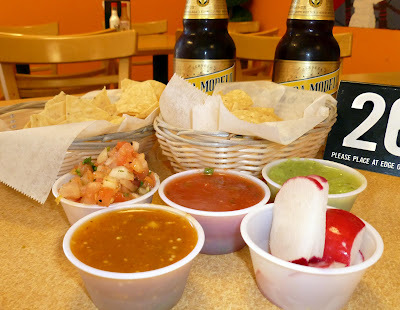 The only heat at this salsa bar was the pickled jalapenos. Our meal was prepared promptly and delivered to our table. We received two nice looking plates of our two favorite Mexican dishes. The Chile Verde had a generous pile of cubed pork. This pork was tender and flavorful. The green gravy was thick with vegetables and satisfying. This plate was devoured with the help of two warm corn tortillas. Ms. Goofy’s enchiladas were warm and comforting. A dollop of avocado and crema was like the topping of a cake. This is a routine that we love to repeat. The quest will continue. While we thoroughly enjoyed our meal today it was not the ‘Ultimate Chile Verde’ plate. This green sauce did not have the fire and warmth that could of ended our journey. 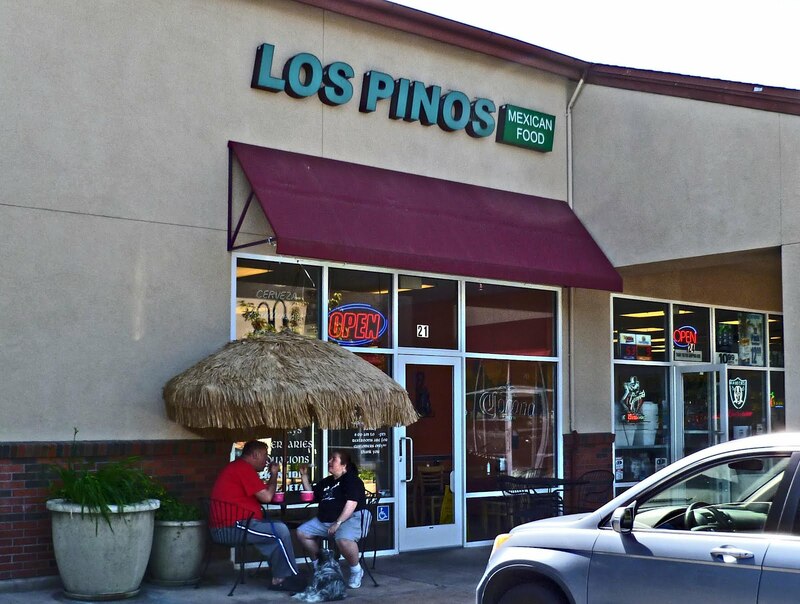 ‘Los Pinos’ is a very satisfying and comforting Mexican restaurant. We would be happy to return if it was not for our quest. 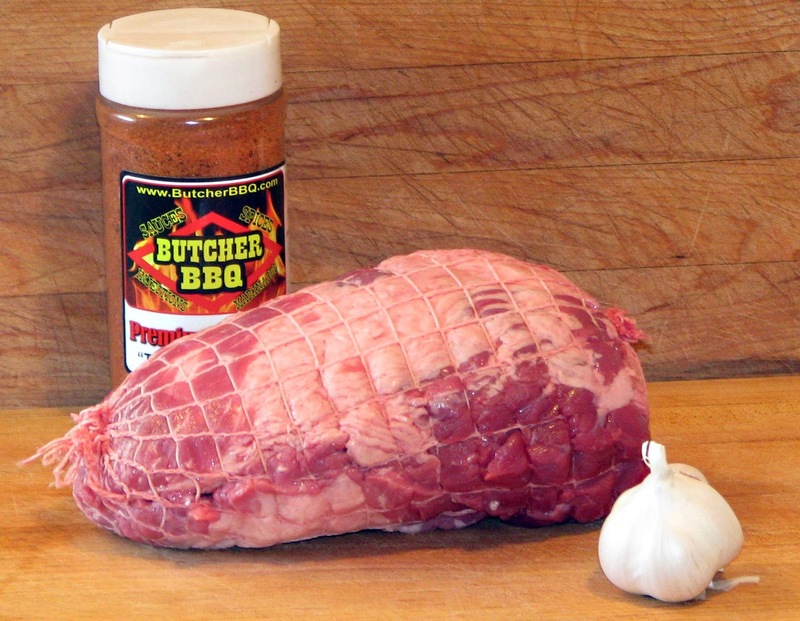 The barbeque community is a special group that we are proud to be card carrying members. Competition, camaraderie, and tasty food are involved at all of our events. 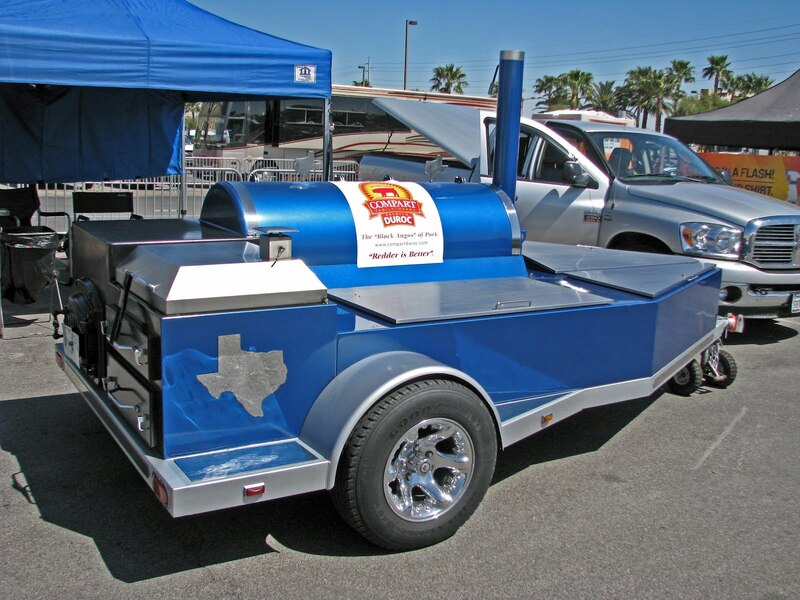 A lot of the competitors are involved in the BBQ industry during the week. 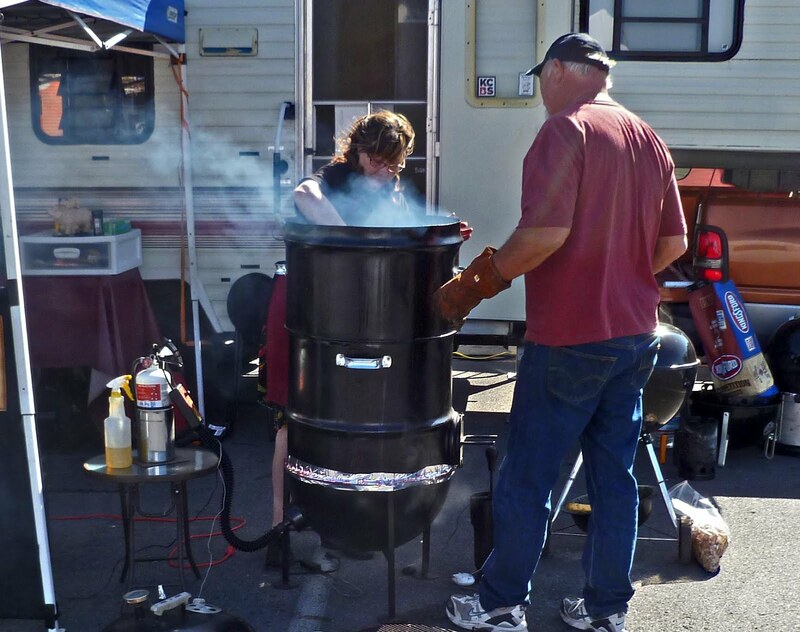 ‘Bart’s Blazin Q’ is a competition team that runs a successful catering company. 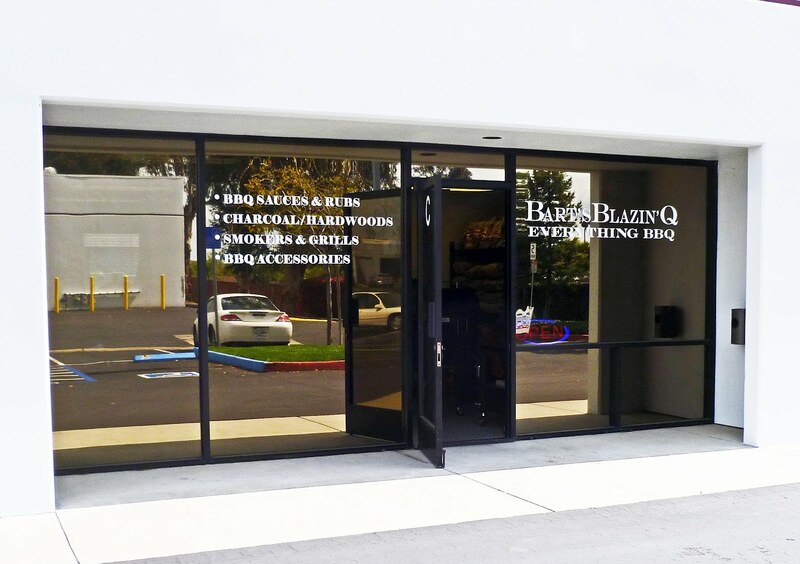 They have decided to expand their business and open a barbeque supply store in Livermore, California. We fired up the ‘Racing Honda’ and hit the road to visit this new venture. 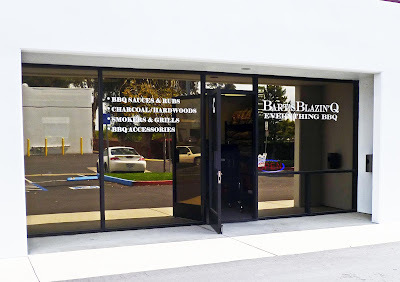 Bart’s Blazin Q is located in a nondescript business park just on the outskirts of downtown Livermore. The store is situated in the back and not marked very well. We drove by it on our first pass. Once found the inside was a treasure trove of barbeque supplies. Dave Bart greeted us with open arms. Sauces, rubs, charcoal, and barbeque utensils adorned the walls and shelves of this small store. The floor was decorated with different models of barbeques. 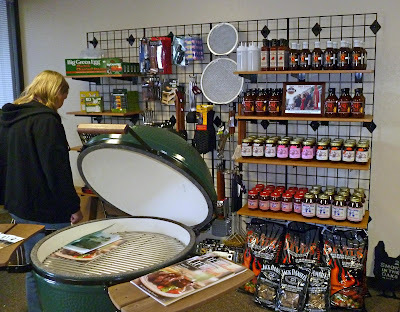 There it was, the ‘Big Green Egg’, right in the middle of the store. It was beautiful. Ms. Goofy shed a tear. (Maybe that was me). 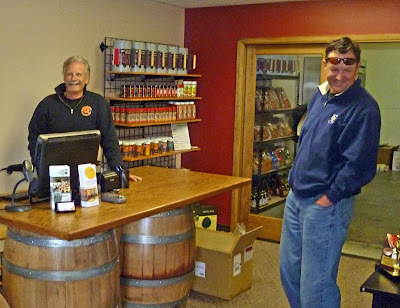 Dave offered some samples of barbeque sauces. He has a sauce that is his own creation and it is very tasty. We had a good time visiting with Dave and swapping stories. We purchased several items and said our goodbyes. Alas, the ‘Big Green Egg’ is still sitting in ‘Bart’s Blazin Q’ showroom floor. Dave & Deny Bart have a great new store to stock up on all your barbeque desires. Hopefully we will return to make that special purchase. Ms. Goofy celebrated her 29 birthday once again. I have not always been the best judge of gift giving in the past. She did not like the lawnmower, which was a top of the line, self propelled beauty of a grass muncher last year. All this has changed with her birthday present this year. Ms. Goofy loves cheese. ‘Cheese of the Month’ just made sense. This is not your ordinary processed run of the mill variety of cheese but ‘Artisan’ cheese selected by ‘Cowgirl Creamery’ of Pt. Reyes Station, California. Each month three cheeses will be selected and shipped to our front door. Her first shipment included a bamboo cutting board and several specialty cheese knifes. This month the selections included; ‘Dante’, (An aged sheeps milk cheese from the Wisconsin. 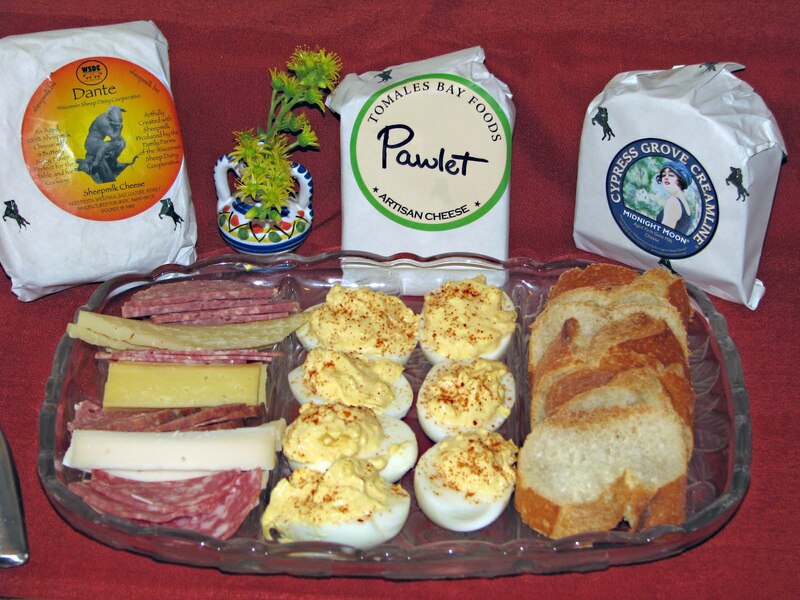 ), ‘Pawlet’ (A creamy goats milk cheese from Vermont) and ‘Midnight Moon’ (An aged goats milk cheese in the Gouda style from Arcata, Ca.). Ms. Goofy is enjoying her birthday present. I am patting myself on the back for now but will be preparing for Ms. Goofy’s 29 birthday next year soon. Ms. Goofy had a hankerin for corndogs. The county fair circuit does not start for several more months. 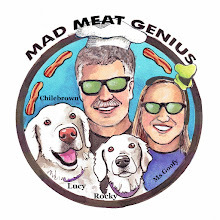 We had to fill this corny desire for the ‘big dog’ of the Mad Meat Genius household. While in Las Vegas, we went shopping at the only store I actually like to shop at, ‘Bass Pro Shop’. This huge store has everything a man needs or wants for the outdoors. 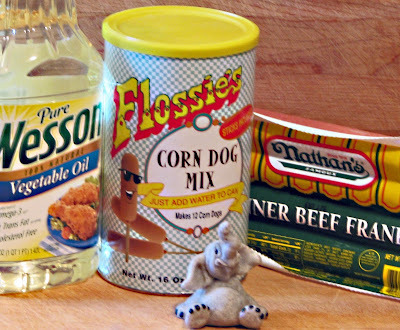 They also happen to sell ‘Flossie’s’ corn dog mix. Sticks are included and all you do is add water. This was perfect to inspire and fill Ms. Goofy’s corn dog wish. Skewer your hot dog with the included stick and dip in batter. Heat the oil to 375 degrees and cook until golden brown. Four minutes later it is the county fair in our kitchen. I did throw in a couple of mushrooms into this corny batter. The corn dogs were just as you can imagine. This batter was on the sweet side. Flossie’s filled a need and delivered. What the heck, everybody needs some ‘Damn Fine Bacon’. 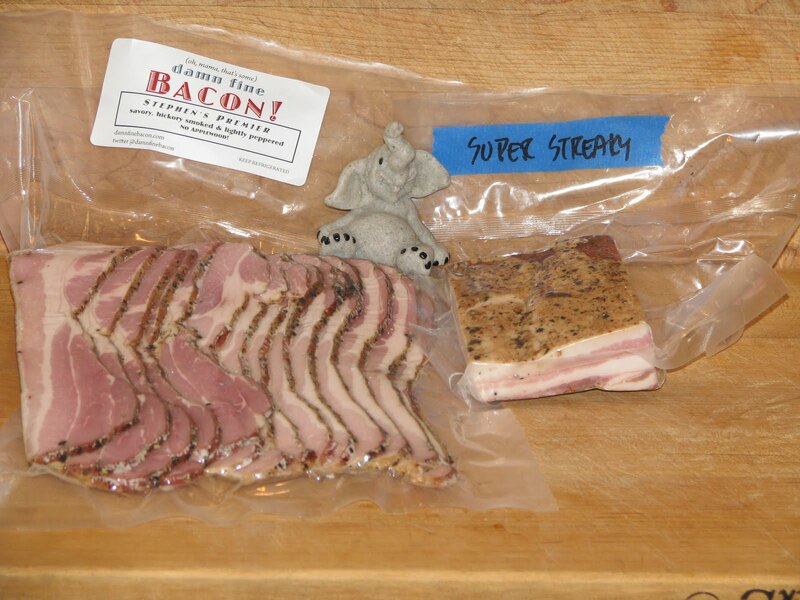 This bacon is a specialty treat to be only found in the Bay Area California. It may even be illegal to buy this designer, craft, one of a kind, natural cured swine. This bacon needs to be ordered and picked up at two secret locations on either side of our Bay. Is may be worth the effort for this special treat. We ordered of a three month subscription that set us back 45 dollars on PayPal. Twelve dollars and change a pound may be a very cheap price when you factor in the Bay Area ‘Sin Tax’. They do throw in a special gift of streaky bacon or ham with every subscription order. You pick up your bacon at a secret location and ours was at “Craftsmen Style” house in Oakland. 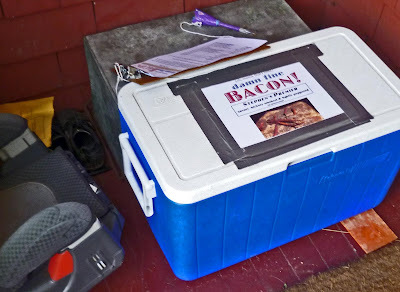 Our bacon was located in a specialty marked ice cooler on the porch. How does it taste? When you open this special package, we smelled an aroma of cured smoked corned beef. The aroma was of pickling spices and vinegar. Of course it was put to the fire on our trusty black iron skillet. This bacon had a lot of sugar content so we cooked it on a very low heat. The meat to fat ratio was heavy on the meat. Crisp, sweet, meaty with a slug of salt is the combination that we ask for in bacon and these rashers delivered. This was a good ration of sugar to salt. These slices were on the meaty side and we were happy. What a fun treat. We are looking forward to next months supply. Live life large and order some yourself!!!!! This is Bucky trying a hot sauce at Lakeman's Club. 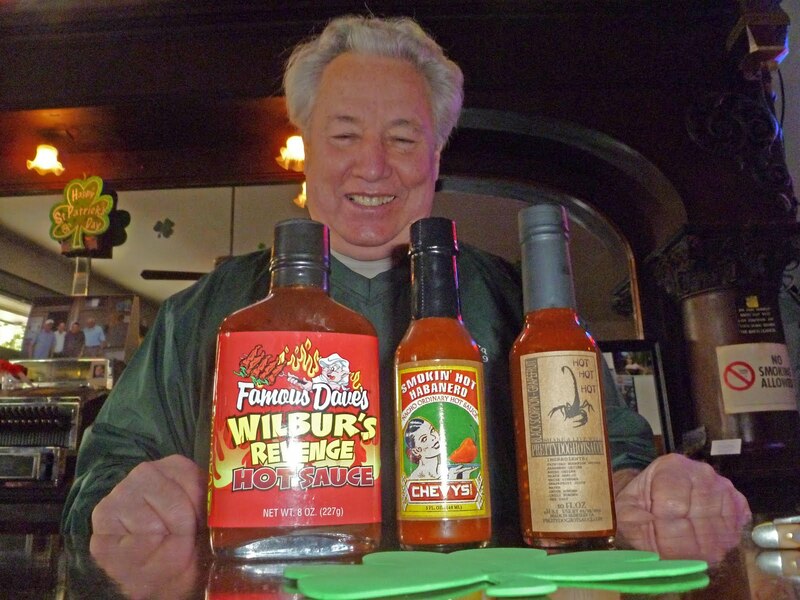 On Saturday's we have an informal hot sauce tasting event. Everybody is welcome and it takes place around 1:30pm. 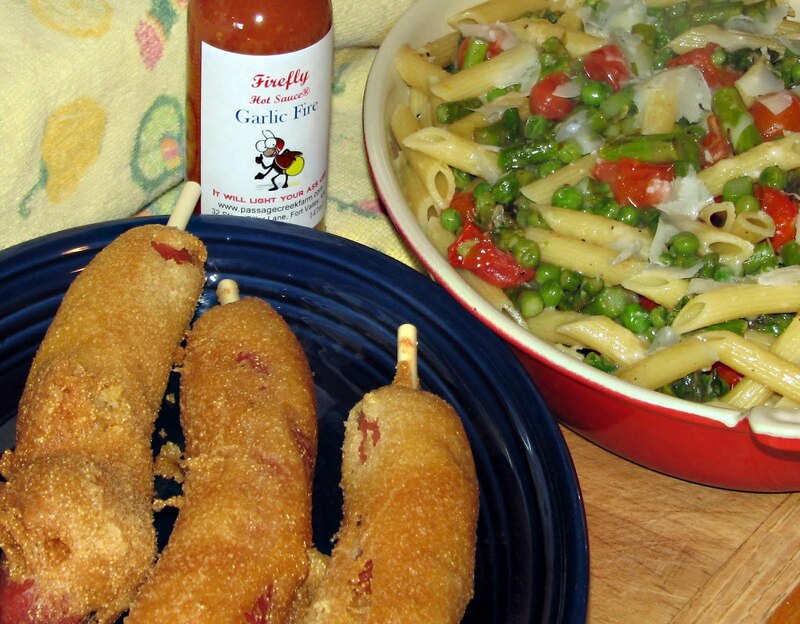 Today we reviewed a sauce from 'Pretty Dog Hot Sauce' company. They are a new company located in Berkeley, California. If you are in the neighborhood Saturday stop on by and have a cold one at Lakeman's. It will be a warming experience. One can only eat so much BBQ and chicken wings. 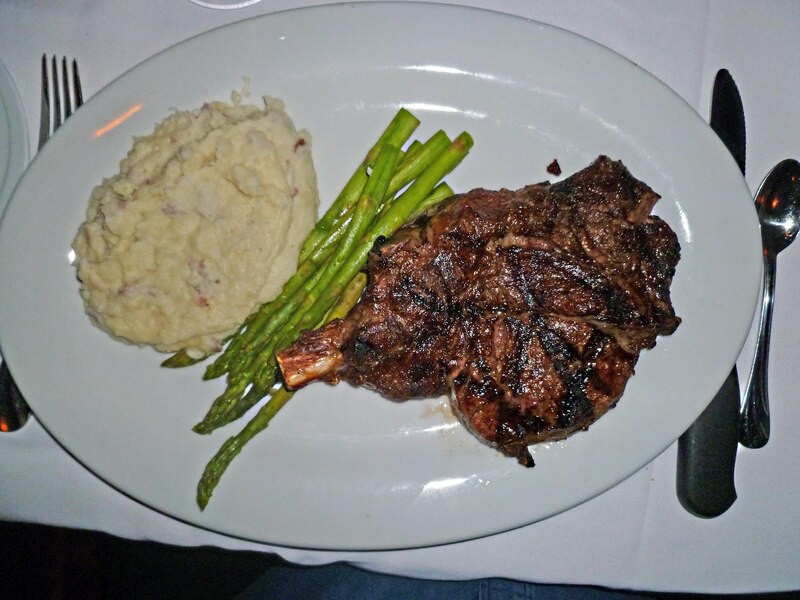 Sometimes the only thing that will satisfy a Mad Meat Genius hunger is a 22 ounce bone in rib-eye steak. In Las Vegas our go to steak house in located in the Circus, Circus casino. This is an elegant non frilly meat emporium. 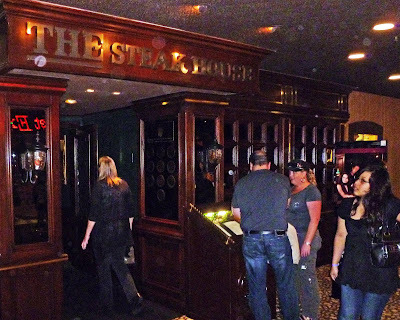 Dark paneled wood with low lighting creates a mood that sings the praise of grilled beef. The menu is simple with only different cuts of beef with a lobster thrown in. Soup or salad is only listed to keep you occupied until the main show. The kitchen is located in the middle of the restaurant. Two very hot mesquite charcoal fueled grills makes for a in-house cooking show. This steak did not disappoint. Medium rare to perfection was this mesquite kissed hunk of prime beef. Now that we have returned home I may have to find a salad bar. 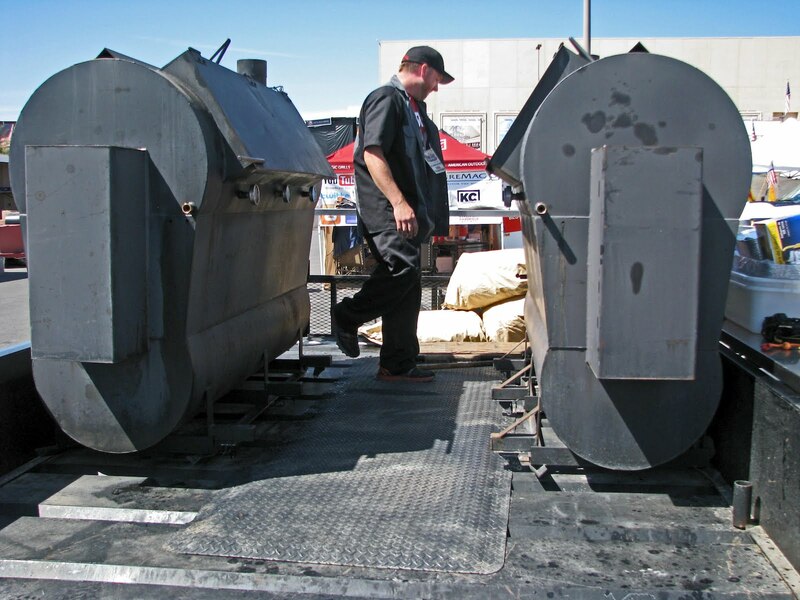 The barbeque competition was held in the parking lot of Mandalay Bay Casino. This was a huge lot that contained more than just the BBQ competitors. A huge stage showcased some of the hottest Country music stars of the day. I have to admit that I am country music challenged and did not recognize any of the performers names. That did not stop a lot of adoring fans from enjoying this venue. Jack Daniels was one of the sponsors and had an area set up to help lubricate and refresh these admiring fans. 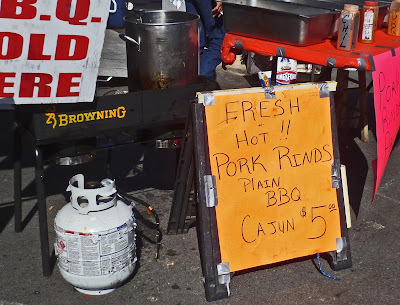 There were plenty of booths to offer food and nourishment for the Country music fans. 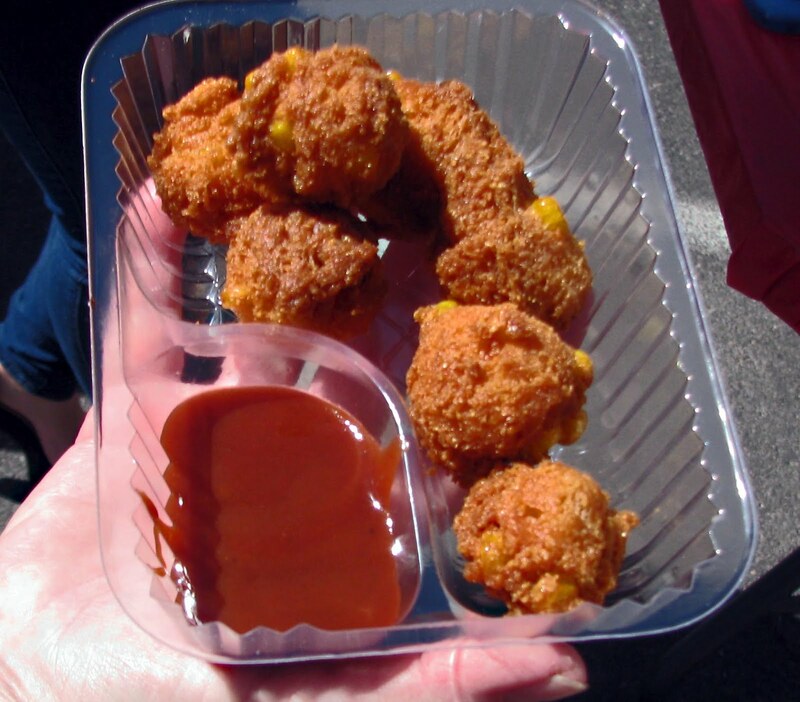 We had to try the deep fried corn bread. They looked delicious. Somebody needed to turn up the temperature on the fryolater because these were little grease grenade bombs ready to explode with intestinal discomfort. 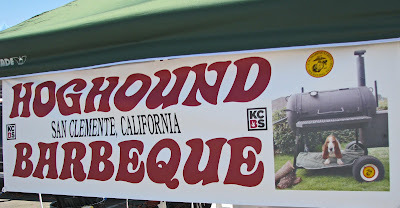 QN4U had a barbeque booth to satisfy the need to sample Brent Walton’s award winning smoked meats. In the convention hall there were lots of vender's demonstrating and selling numerous country themed products. 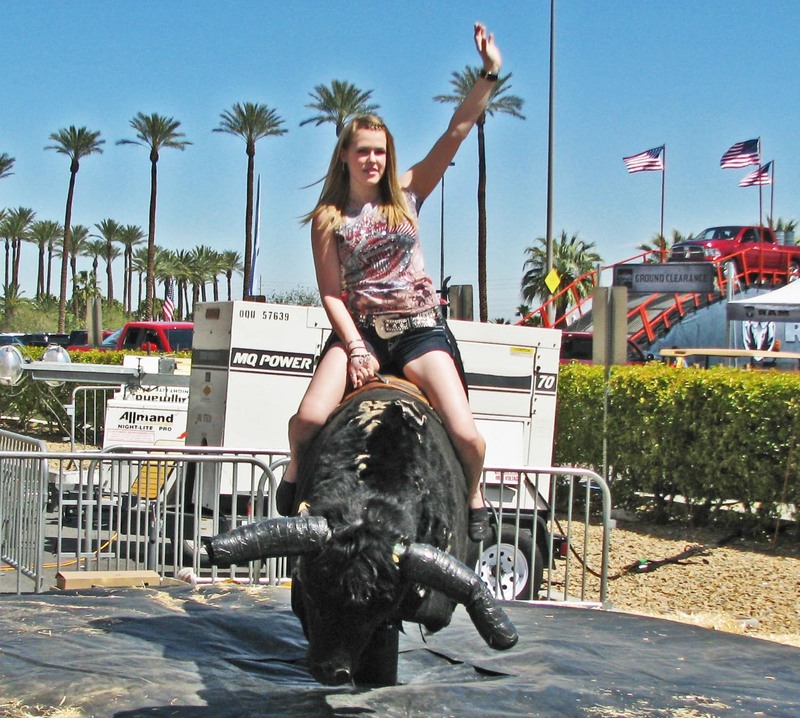 What country festival would not be complete without a mechanical bull? I could not get Ms. Goofy to ride this time. We probably should have visited the Jack Daniels booth a little longer. 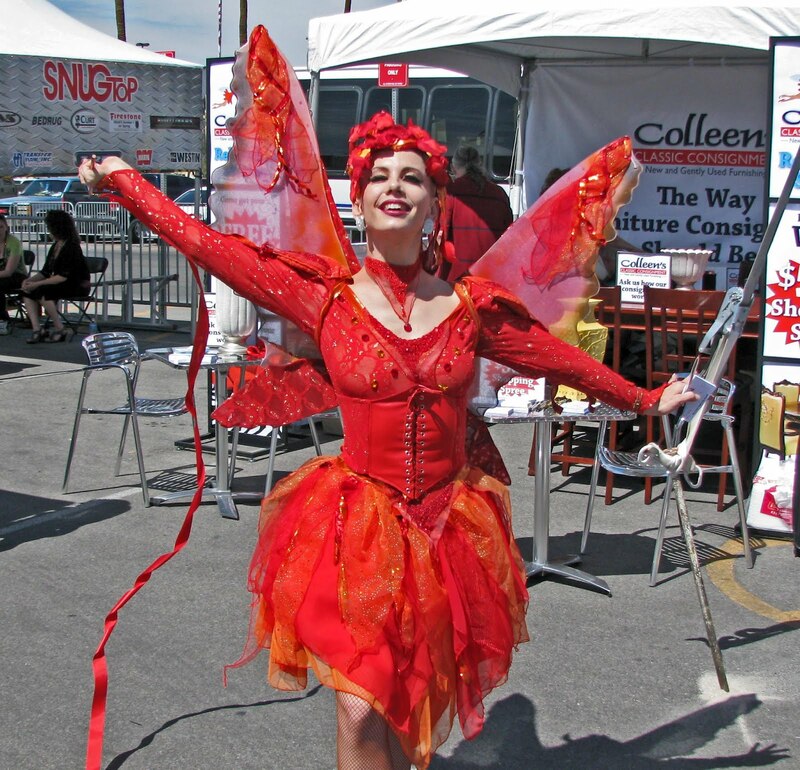 A lot of the festival attendees were wearing traditional country garb. It is a good thing the temperature was in the low 80’s for these two cowgirls. Most important to us was the barbeque competition.. Saturday was judgment day and it was time to put on our game faces. I would like to tell you what hard work it is to taste the best barbeque in the nation but you know better. We do take the judging serious and believe that we are fair in our scores. The votes were tabulated and later in the evening the winners would be announced. Harry Soo of the ‘Slap Yo Daddy’ barbeque team was crowned Grand Champion. He took home a huge cardboard check for 10,000 dollars. After this weekend of over indulgence the salad bar will need to be visited. Las Vegas is a great place to hold a BBQ competition. The Academy of Country Music held a great party.